I'm not sure if this is on-topic or not, please tell me if it is not! Cant see any picture there Ian. Try again now, I made a big boo boo there! Living in Motherwell when I went into Glasgow on the train we would always get off at Argyle Street. Then as a student I always used to get the early bus into town and the last one back. 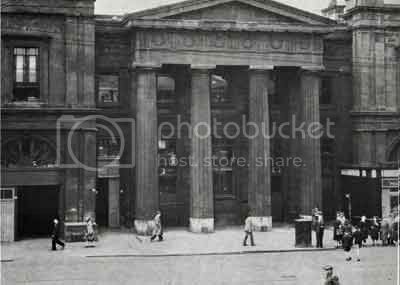 As a result I'd never been to Glasgow Central until I was about 19! I hate the new board as well - the text is far far too small - you used to be able to read the departures easily - and quickly- when coming in the main Gordon St entrance. Opera glasses are now required to do the same thing! That board is awful. What was wrong with the big dot-matrix one?? the building where all the shops are now, to the right hand side of that image. It's a restaurant now or something, innit? The new departure boards have caused a few visets to speck savers. on the subject of Central,anyone know why there are extra support pillars(unused) on the bridge crossing the Clyde.I remember that some art project about 10 years ago,stonemasons carved poems into the "spare Pillers"? Can anyone confirm before Central was built that BridgeStreet was the main Station?And one final one, What was the Large building on the right (track side) Before crossing the bridge,was that part of Bridge Street Station? cumbo wrote: The new departure boards have caused a few visets to speck savers. All of Bridge Street Station is gone Combo, and yes it was the main station for a while until Central opened…. Fossil From that last photo I would say that some of the bridge on the right hand side going into Central has been removed exposing the pillar supports .....Any reason? i hate the new departure boards, the ones for low level which i use could do with a clock on them, they just say time of the next train but you have no-way of knowing what time it actually is, anyone else agree with me?? cumbo wrote: Fossil From that last photo I would say that some of the bridge on the right hand side going into Central has been removed exposing the pillar supports .....Any reason? nuttytigger wrote: i hate the new departure boards, the ones for low level which i use could do with a clock on them, they just say time of the next train but you have no-way of knowing what time it actually is, anyone else agree with me?? ..you could use your watch, mobile phone clock or ask your fellow passengers what time it is. 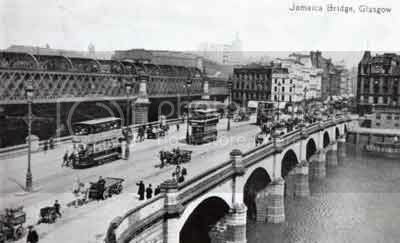 "To the left of the Jamaica Street bridge is the Central Station railway viaduct of 1876-8 built for the Caledonian Railway Co. which demolished an insalubrious area west of Jamaica Street to make way for Central Station. 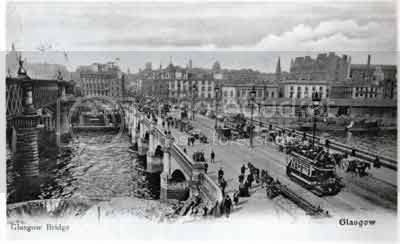 The Company added a second bridge immediately downstream between 1899 and 1905 when the station was enlarged." "1961 when the old Clyde viaduct was demolished and all traffic was concentrated on the six tracks on the new viaduct." EDIT. don't mean to steal James' thunder..
Last edited by AMcD on Wed Jun 02, 2004 10:36 pm, edited 1 time in total. i dont wear a watch, and if my phone batt was dead or i hadn't got it with me, and would you ask fellow passengers???? the amount of drunks that used to be on the 4.38 train to motherwell when i worked in glasgow was unbeleivalbe!!!!! !